Frances passed away on Saturday, March 30, 2019 at the age of 84 years. She is survived by her daughter Olga (Ivan) Vukelic of West Kelowna, BC, her son Henrik (Nancy) Jakovac of Calgary, AB, two grandchildren Vanessa and Dillon, sisters-in-law Maria Poje of Winnipeg, MB, Biserka Jursevic of Croatia and numerous nieces and nephews. She was predeceased by her husband Josip and two brothers Steve (Antonia) and Henry Poje. Franciska was born in Slovenia. She met her husband Josip in Croatia and they were married in 1954. They immigrated to Canada with their 2 children in 1970 and settled in Winnipeg, MB. They raised their family and Franciska stayed there until Josip’s passing. In 2004, she moved to Kelowna and lived there until she passed away. 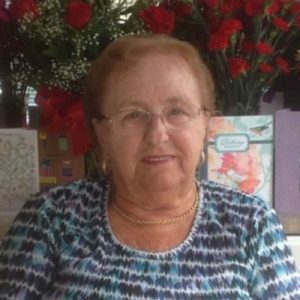 The service for JAKOVAC, Franciska (Frances) is scheduled for Monday, April 8, 2019 at 2:00 pm. Below you will find the map for the service location and the contact information should you have any questions. Our sincerest condolences and deepest sympathies for your loss. We will always remember Teta Fransika’s welcoming smile and kind heart. Our thoughts are with you and your families during this difficult time. Olga,John,&family…Our sincere condolences to you with the passing of your mom. We are unable to attend the funeral but will be thinking of you at this time.